Reminder: NYC Ska Gig Alert: The Toasters, The Pietasters, Hub City Stompers, and Royal City Riot at B.B. King's Tonite (10/29/10)! Just a reminder that tonight's show at B.B. King's is much earlier than you might expect (particularly for a Toasters' show, which is typically very late). I was speaking with Buck about another matter and asked him about the timing of the performances--he told me that The Pietasters are going on around 8:00 or 8:30pm and The Toasters will be on around 9:00 or 9:30 pm...(Royal City Riot start at 6:30 pm). NJ Ska Gig Alert: King Django Tonight and Saturday Nite! NYC Ska Gig Alert: The Toasters, The Pietasters, Hub City Stompers, and Royal City Riot at B.B. King's This Friday Night (10/29/10)! This Friday night there is a special all-ages ska show at B.B. King's on 42nd Street in Manhattan featuring The Toasters (that's Buck at work there in the photo) and The Pietasters. It's a reasonably priced evening of top-shelf ska ($15 in advance, $17 the day of the show), but note that it is early: the doors open at 6:00 pm and the first band is on stage at 6:30 pm. If you haven't been here before, B.B. King's is really a great place to catch a show. It's easy to get to (almost every train, bus, and subway in the metro area stops near here), it feels very intimate for a place that probably fits about 1,000 people, the sight lines are good, and the staff is pretty mellow. Fishbone was in town last Friday (10/22/10) to screen the new documentary about them, "Everyday Sunshine: The Story of Fishbone" (by Lev Anderson and Chris Metzler, and narrated by Laurence Fishburne), and play a CMJ showcase, which received a rave review in the free daily AM NY. After 2 Tone imploded, Laurel's fortunes waned a bit (though the royalties from UB40's cover of "Guilty" on Labour of Love in 1983--which Laurel had originally written and recorded in 1971 under the name Tiger--certainly must have helped) until a chance encounter a few years later with Gaz Mayall (recounted in his recent book, "Gaz's Rockin' Blues: The First 30 Years," the review of which can be found here), who booked him to play numerous gigs at his "Gaz's Rockin' Blues" club night to a fresh crop of post-2 Tone ska fans. 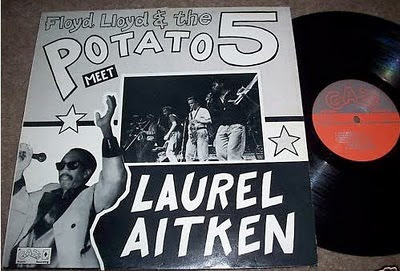 Gaz also had the brilliant idea of pairing Laurel up with an upstart traditional ska group, the Potato 5, who then released two phenomenal singles composed by Laurel on Gaz's Rockin' Records (distributed by Stiff Records): "Mad About You" and "Sahara" (both 1986). 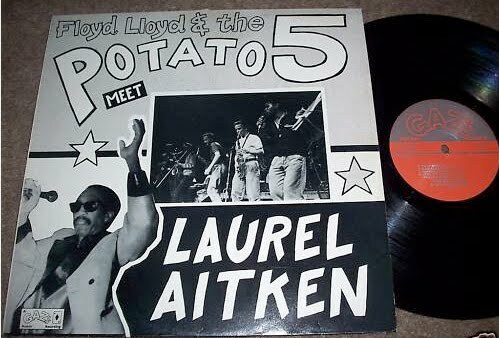 Indeed, Laurel's collaboration with the Potato 5 yielded some of his greatest songs, in terms of songwriting, performances, and studio production (read The Duff Guide to Ska review of the two albums Laurel cut with the Potato 5 here). Gaz claims to be the one who coined Laurel's "Godfather of Ska" moniker (and released a compilation of the same title of Laurel's early ska singles on Gaz's Rockin' Records). After Laurel and The Spuds parted ways (and the latter calling it quits after a brutal US tour), he hooked up with a new backing band in The Pressure Tenants and forged a very fruitful working relationship with Mark Johnson and Unicorn Records, releasing both new material as well as brilliant compilations of his sixties-era singles (see Unicorn's massive discography here, lovingly assembled by John at Hoi Polloi Skazine). Unicorn had managed to establish a considerable global reach through a series of international ska compilations, as well as licensing albums and EPs from top acts in the US (Toasters, Donkey Show), UK (Derrick Morgan, Potato 5, Deltones, Hotknives), Germany (No Sports, The Busters, Skaos, The Braces), France (Machtoc), Denmark (Napoleon Solo), Sweden (Baby Snakes), Netherlands (Mr. Review), Italy (Spy Eye, Casino Royale, Strange Fruit), and Australia (Late Notes, Just Kidding)--all of which provided Laurel with the means to convert an eager new generation of ska fans scattered across several continents. While the "Everybody Ska" single (which must have been trading on the UK acid ska fad of 1989) is a bit cringe-inducing, its B side, "Skinhead" redeems things significantly ("When a skinhead walks down the street/every chick heart skips a beat!" --the man sure could turn a phrase). The four-track Sally Brown EP (1989), featured the title track (not quite as robust as the version he cut with the Potato 5, but spectacular nonetheless; Bad Manners also covered it on Return of the Ugly), "Hey Little Girl," "Since You Went Away," and the magnificent and heartbreaking "Rude Boy Dream," certainly amongst his greatest compositions ever ("I dreamt I was the President/Living in a tent/But when I woke up this morning/I was thrown out for not paying my rent/Everybody knows I'm a rude boy/Walking the streets of dreams..."). While not included here, Laurel also cut a live four-track EP with The Loafers titled Mad About Ska (Staccato Records, 1989) and the "Boogie with the Bartender" b/w "She was My Girl" single with The Busters (Weser Label, 1989). Ringo the Gringo (1990), Laurel's first solo album in two decades (again backed by The Pressure Tenants), recorded when he was in his early 60s (! 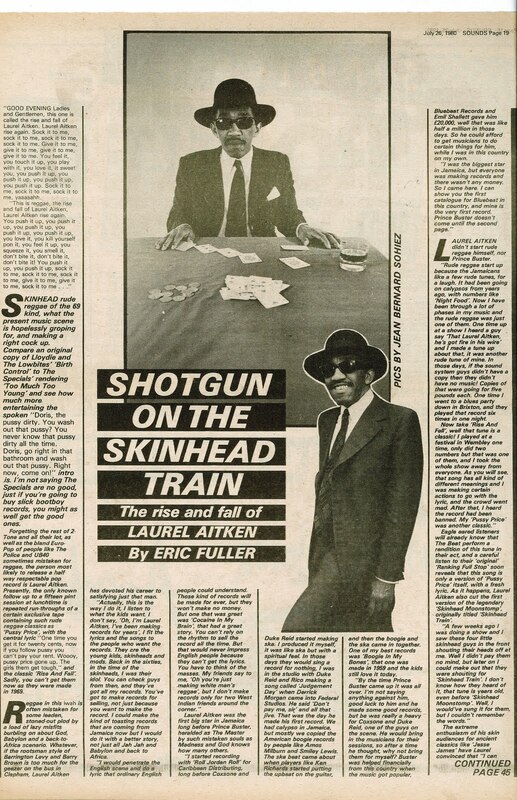 ), is filled with a string of top-notch ska and skinhead reggae tracks, represented here by "I Love You, Yes I Do," "Looking in the Mirror," "Don't Turn Your Back," "Peggy Sue," "Hitch Hike," and the grin-inducing, over-the-top bravado of the spaghetti western-themed (and challenge to Prince Buster) "Ringo the Gringo" ("So you say you are the Cincinnati Kid/and you want me to leave town/Ringo won't leave town/until he gun you down!/Ringo the Gringo!/I kill Jesse James/I kill Billy the Kid/I kill Ned Kelly/and I shot J.R!"). The last track on this compilation, "Bartender," is an excellent version of this tune that I've never heard before, cut with The Pressure Tenants in 1992 that avoids some of the synthesized sound choices that slightly mar some of the Ringo the Gringo tracks. 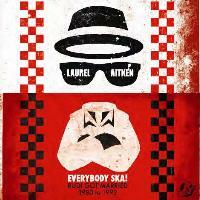 During the remainder of the 1990s and well into the 2000s, Laurel went on to work with several other labels to release new material and re-issue his classics, including Moon (USA), Grover (Germany), Liquidator (Spain), and even Island Records (he recorded "Rudy Girl" backed by Freetown for Ska Island, the label's 40th anniversary ska comp that featured new recordings of classic 60s tracks covered by Fishbone, The Skatalites, Doreen Shaffer, Prince Buster, The Determinations, Dr. Ring Ding & The Senior All-Stars, The Ska Flames, The Toasters, Ocean 11, Ernest Ranglin, Jump with Joey, Rico Rodriguez, Hepcat, and The Trojans--and recorded and produced by Gaz Mayall). He made guest appearances on albums by groups like The Toasters and Ska Flames, and continued to play incredibly spirited live shows (most notably, several tours of the US during the height of the so-called Third Wave in the late '90s) until his death in 2005. Laurel's exceptional gifts as a composer, musician, and performer were such that he was able to sustain a successful career for almost half a century, appealing to successive generations of ska and reggae fans world-wide. Anyone who discovered his records treasures them; everyone who saw him perform on stage became a devoted fan for life. 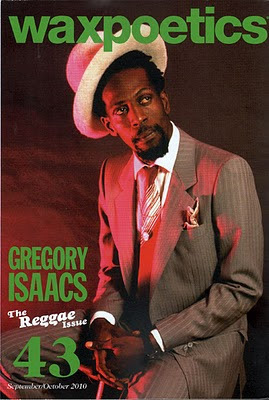 The BBC has reported that reggae singer Gregory Isaacs has died in London at age 59. Read an appreciation of the artist by Tim Sendra and watch several music videos at AllMusic.com. Update: The New York Times has a very informative obituary for Isaacs, which may be read here. Also, Wax Poetics' September/October 2010 all-reggae issue also happens to have an interview with Gregory Isaacs that is definitely worth finding and picking up (and the issue includes features on Augustus Pablo, Sugar Minott, Beres Hammond, Bob Andy, Chris Blackwell, and more). Duff Interview: Sean Flowerdew on the 2011 London International Ska Festival (Plus The Caroloregians Just Added to the Line-up)! 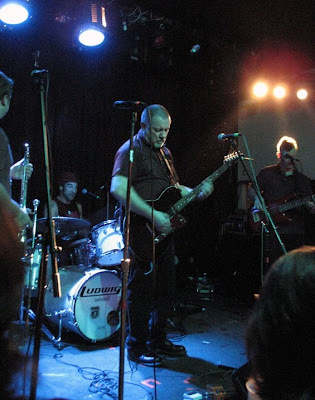 The Duff Guide to Ska is most grateful to Sean Flowerdew (Pama Intl, Rockers Revolt Records, The Loafers) for taking the time to do the following interview with us regarding the upcoming 2011 London International Ska Festival (LISF). At the time of this interview, he was in the midst of playing Pama Intl's last few shows (promoting their most recent album, Pama Intl meet Mad Professor-Rewired In Dub) before the band goes on extended hiatus--whilst simultaneously putting together the ska fest, and running his label (and you thought you had a lot on your plate!). The Duff Guide to Ska: Why is this the most opportune time to re-launch the London International Ska Festival? What has happened on the ska scene (or in your life) to make this the right time to do it? Sean Flowerdew: I'm not sure it's the most opportune time, but there certainly is a lot of interest. Obviously The Specials reforming, Madness releasing a fantastic new album, people like Lily Allen and Amy Winehouse championing the ska sounds, Soul Jazz reissuing Studio One comps with very nice packages over the last few years have all combined on a mainstream level to create more interest in ska. Soul Jazz particularly seemed it make it cool and hip again. And of course, there've been people working very hard on a grassroots level to keep things moving forward: Do The Dog (label and zine), The Brixton Hootananny (puts on free ska gigs every Friday to 400-500 people and has some bigger names on at low prices), Gaz's Rockin' Blues celebrating it's 30th anniversary (the longest running club night in London); plus loads of ska-inspired bands gigging: The Amphetameanies, Bombskare, Cartoon Violence, Dub Pistols, Babyhead, Jimmy The Squirrel, King Blues, Maroon Town, all the 2 Tone guys, Sidewalk Doctors, Intensified, Rasta4Eyes, Pama Intl, Splitters, Simmertones, Dirty Revolution...US touring bands like The Aggrolites, Slackers, Big D. And club nights/sound systems around the country like Pressure Drop, Funkdub, Reggae Train, Tighten Up Crew, Set The Tone, Downbeat Melody, Axis Sound System, Sounds & Pressure all regularly spinning ska sounds. I'm sure I've forgotten loads as well! It's very healthy times for the ska scene again, but that wasn't the catalyst for me deciding to relaunch this though. All year I've been looking at my own work with Pama Intl and Rockers Revolt label and just trying to figure out what I want to be doing next year and further into the future. And for the first time in Pama Intl's 10 years...I didn't see anything, or rather I wasn't inspired to do anything. So, rather then do 100 Pama Intl shows throughout the year, I thought it be good to put all my energies into one event. I know the ska scene better than any other music scene, nostalgia's in fashion, so I thought I'd relaunch The London International Ska Festival. For once, my hunch that others would be interested certainly seems to be accurate, judging by the feedback. DGTS: Apart from ska stars like The Specials and Madness appearing at mega music festivals in the UK like Glastonbury, have there been any large ska festivals there in recent years? SF: One reason I'm putting this on is I don't believe there's been a ska festival in the UK that has done the genre justice, for years. I include some of my own nights when I say there's been a lot of sub-par promotions in the name of ska. The first ones I was involved with were very good. I programmed and promoted the first LISF at The Brixton Fridge, a 1,400 capacity venue in south London on 21st December 1988. We followed that up with nights at London's infamous, but sadly now demolished, Astoria Theatre. We got TV coverage for those events, mainstream press coverage, and nothing like that has happened on that level since. Except for The Specials and Madness reformations, which of course eclipsed what we did. I truly believe the line-up we're putting together for next year and the attention to detail we're putting into every aspect of the event will set it on a world-class level, the likes of which the UK and abroad hasn't seen. A long-term goal is to establish the genre on a mainstream level across the world. High hopes, I know, but you've got to aim high, and there is the talent in the world of ska and all its offshoots to be able to do it. DGTS: How many fans to you anticipate showing up for the entire three-day London International Ska Festival? SF: It's actually four days long and the way it's selling, I can see all days will be sold out before Christmas! So, 1,100-1,400 people across the weekend. We're mainly only selling weekend tickets for all four days, but there will also be 200-300 day tickets issued. The venue is only 1,250 capacity, and I'll be allocating 150 tickets for radio, press, and promoters. One of the main goals of the fest is to establish it as an annual event akin to the Soho Jazz Festival or WOMAD. An event that is respected the world over. An event that sells out before any of the line up is announced. An event that showcases and shows off how far this amazing genre has traveled and how good it can be. DGTS: Are you the sole person selecting the acts--and what are the criteria for a band to be selected? Were any of the bands that were suggested by fans (on sites like The Specials' Fan site) chosen to appear? SF: Yes, I'm the sole person, although I have asked many people's opinions (DJs I respect, my brother [Do the Dog Music's Kevin Flowerdew], other bands) and put out on the Facebook page asking people who they'd like to see. It was great to see I was pretty much on the right track. Many of the bands people were asking to see we've got. We're also going to blow people away with some of the things we're managing to get together for this. The basic criteria is I've got to like the band. They've got to have a story, be it a legendary one or a new band one. I've got to be able to sell them to the press and radio, and ultimately sell tickets off the back of their name. There is a huge financial risk to this. The bill currently stands at £100,000, so I need bands that will pull people. DGTS: Your old band The Loafers are reuniting for the occasion. What's the biggest challenge to preparing for your performance? SF: It's actually really nice to be doing a band for the shear enjoyment of it. Unlike the last 10 years with Pama Intl, there is no major challenge. We'll rehearse, Nas (drums) and Trev (bass) play regularly as Big Boss Man and The Bongolian, and Finny and I have of course been doing Pama Intl, so we should be able to knock it into shape. I suppose one challenge is The Loafers always got by on youthful enthusiasm, which I don't think any of us have now! It's 21 years since we played together! DGTS: If The Loafers' appearance exceeds your expectations, is there the possibility of doing more reunion gigs? SF: No, it's an exclusive for the festival. I wanted to have a few things happening at the LISF that won't happen anywhere else, and set it apart from what anyone else is doing. The Loafers is one of those exclusives. Another one is getting the original Hotknives line-up to reform for a one-off. Continuing with The Loafers isn't something I'd want to pursue. And I'm sure the same can be said for other members in the band. We've all got big fish to fry. 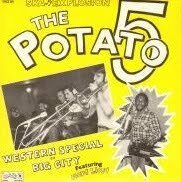 DGTS: What are your favorite moments from the first London International Ska Festival that you organized back in 1988? SF: Seeing a queue stretching up the road and out of sight before doors was pretty incredible. Having all my favourite bands under one roof was great...Hotknives, Potato 5, Capone & The Bullets, Laurel Aitken, Napoleon Solo were pick of the bunch for me. I had Gaz Mayall MCing the night and he brought Prince Buster down with him. I was 17 when I started putting it together, so it was a pretty incredible feeling to realise I'd managed to get it to work. DGTS: When do you expect that the entire bill with be finalized (and are there any new additions to the festival that you'd like to announce here)? SF: We go on general sale with tickets early November '10, and I'm hoping to have most of the line-up finalised by then. We nearly have all the bands agreed, we're just working through contracts and waiting to fill two of the headline slots. We have offers in with five great acts for the two places, so it'll be the first ones to decide get it. We'll definitely have it all set by December '10. The latest additions to the festival are...the Grammy-nominated singer James Hunter, whose sound is more of a soul and R'n'B style, akin to the sounds the Jamaican originators were tuning into. He's amazing. Van Morrison describes James as "the best soul voice to come out of Britain," and there a lovely ska lilt to a lot of his music. We've also got The Caroloregians from Belgium. I love these guys. They've got a great raw skinhead reggae meets the Meters funk thing going on. More to be announced start of November! Slits singer Ari Up passed away earlier this week at the much too young age of 48. Read her obituary in The New York Times. Also find out why The Slits were so revolutionary and influential here and here. Duff Review: Sharon Jones and Ticklah: "How Long Do I Have to Wait for You?" b/w "How Long Do I Have to Dub for You?" 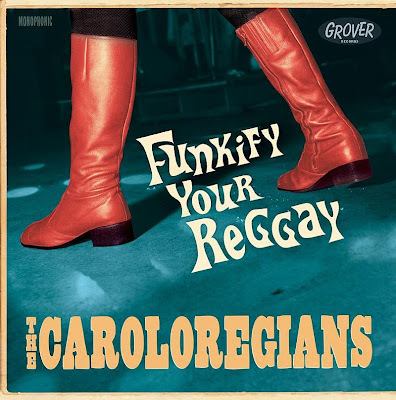 Soul music's powerful influence on ska, rocksteady, and reggae is readily manifest on numerous recordings throughout this genre's history, from the sixties (with artists like Laurel Aitken, Jimmy Cliff, Alton Ellis, Marcia Griffiths, Phyllis Dillon, Slim Smith, and Joe Higgs, to name a few) up to the present day (Babylove & the van Dangos, Green Room Rockers, The Bullets, and The Bluebeats, amongst many more). Yet rarely is there such a direct and potent intersection between practitioners of each style as there is in the versioning of Sharon Jones & the Dap-Kings' funkified soul tune "How Long Do I Have to Wait For You?" (from their 2005 Naturally album) by ace dub/reggae keyboardist and producer Ticklah. Ticklah (AKA Victor Axelrod, who is a member of Antibalas, the Easy Star All-Stars, and Sharon Jones & the Dap-Kings) has taken Sharon Jones' luscious, pleading vocals from the original soul version of this track (a stunner in itself) and then re-recorded all of the instrumental tracks on his own in an early reggae manner--and the results are extraordinary. The song seems timeless, as most classic tunes do. It could have been recorded in the late 60s in Kingston or yesterday in the UK. The flip side features Ticklah's excellent keyboard-heavy dub of this cut. 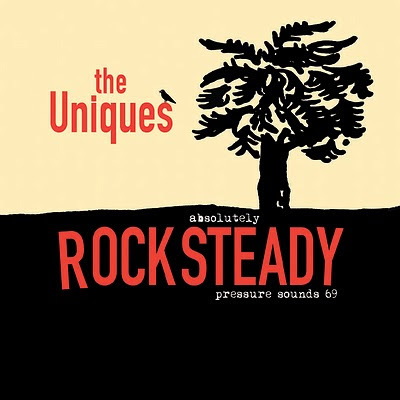 While this isn't a new release (I just happened to come across it at Ernie B's Reggae and ordered it--though it was released in 2008), it is a real treasure that shouldn't be missed by fans of soulful rocksteady and early reggae. Free Bullets Download from New Reggae 69 Fan Club! Join the new mailing list for the recently launched Reggae 69 Fan Club site and receive a FREE download of "Sun Drenched Witch" from The Bullets' debut album Sweet Misery! That’s right, just for signing up for the mailing list, they’ll send you a brand new track from Roger Rivas & The Bullets! Roger is no stranger to readers of Lawless Street and as a member of The Aggrolites has been rocking the sweet, sweet sounds by the pound for many years. He’s been nice enough to offer a FREE download as a sign of support for the Reggae 69 Fan Club launch. What is the Reggae 69 Fan Club? Well it’s a club for the fans of a young Jamaican ghetto and UK sub-culture music that has been taken around the world. Life, Style, Lifestyle. Find out more info at the website www.reggae69.com as it becomes available. For now, either go to the website itself and sign up or visit the mail list page www.reverbnation.com/reggae69 and sign up there. Once you have put in a valid email address, you’ll be able to download the track instantly from the site. REGGAE FOR THE PEOPLE! You can download and purchase the full length album directly from the band’s website here: www.bulletsmusic.com/store.html. 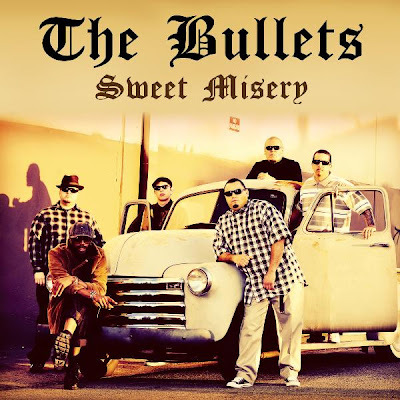 In case you missed it, read The Duff Guide to Ska review of The Bullets' Sweet Misery here. And don't forget that The Bullets' CD and LP is also available from Jump Up Records. 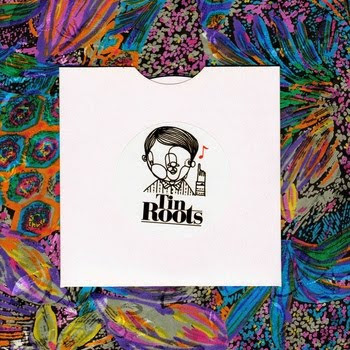 London's Tin Roots are a terrific female-fronted group that sports a crisp and distinct modern reggae/ska sound that defies easy categorization, but should definitely appeal to fans of vintage ska and roots reggae. One major element that sets Tin Roots apart is lead singer/guitarist Ruby Taylor's ethereal, yet commanding voice. It may remind one of Lily Allen's, but Taylor's is much more colorful and pure--and it's mesmerizingly gorgeous. The songs on Tin Roots' new four-track Set Sail EP are uncluttered and precise; they project a shimmering sound, like sunlight dancing off translucent seas on the clearest of days. "Set Sail" (the video is below) is a skittery cut about navigating one's way through life--destination unknown: "For every time that I ever sinned/I feel cold touch of the wind/Know it’s there to teach but not to preach/And I will listen to its ways/A tingle to the skin I know it’s with me/In dark times it will keep guiding/While this life I ride is un-indentified/Exactly why I’m here." The deep, dubby "Other Day" and slinky "Basically" ("...I have no clue") are strutting, chin-jutting-out defiant rootsy tracks, while "Closed Doors" is a mournful, self-doubting/paranoid minor-key ska tune that questions what exactly is going in there--in both physical and mental spaces ("Do what goes on/behind closed doors/If one can ever find the key/I will go back/and push on through/Till then I'll always wonder/Was this my third time now?/I hesitate/I contemplate/I might never know why..."). One thing is for certain, Tin Roots have crafted a fresh and intriguing sound--and I definitely want to see where they are going to take us next. In a move to help better promote what is going down on the ska scene, Dave Kirchgessner (Mustard Plug, Ska Is Dead) is spearheading a new Facebook page called Ska Massive, which will include ska-related news and developments posted by the folks behind Jump Up Records, Stomp Records, Stubborn Records, Megalith Records, The Ska Parade, and Musical Occupation. In a synergistic move, Dave has re-branded the annual New Jersey-based "Skanksgiving" fest. It will now be called "Ska Massive" 2010 and take place on Saturday, December 4 at the Starland Ballroom in Sayreville, NJ. 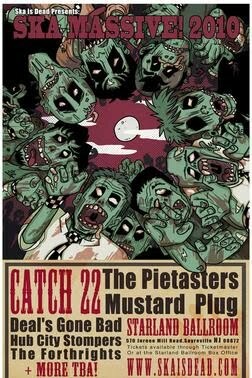 Bands performing include Catch 22, The Pietasters, Mustard Plug, Deal's Gone Bad, The Forthrights, and Hub City Stompers. No doubt you've heard that Ska Is Dead, Asbestos Records, and Underground Communique Records are releasing a series of "Ska is Dead" split 7" vinyl singles ("new music on a dead format"!) featuring bands like The Beatdown, Reel Big Fish, Mustard Plug, Big D & the Kids Table, Bomb the Music Industry!, The Slackers, and Sonic Boom Six. This is a subscription-only deal--you pay $36 and they ship you six singles in total: two each in three installments. To order, go here. 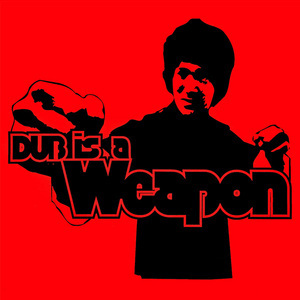 The greatly anticipated (and long-awaited) new album from the NYC dub collective Dub is a Weapon will be released in February 2011 on Jump Up Records! Word is from Dave Hahn that guest artists featured on the record include trombonist Buford O'Sullivan (Easy Stars All-Stars, ex-Scofflaws, ex-Toasters) and reggae singer Rob Symeon. For a good taste of their dread sound, check out their devastating Armed and Dangerous EP (Jump Up) or the digital tracks available on their website. ROOTS ROCK REGGAE - Every Thursday! 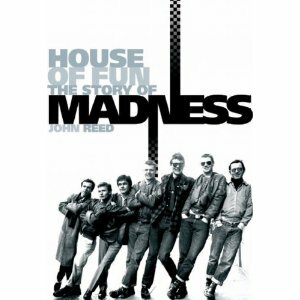 New Madness Book "House of Fun," "Gogglebox" DVD Set, Tour, Reissues! In its lively review of the new Madness biography, MOJO Magazine bestows four stars on the "meticulously researched," 500 page (!) "House of Fun: The Story of Madness," written by John Reed. The MOJO reviewer David Hutcheon describes their rise from "a folk group, rooted in Irish traditions and English music hall" crossed with "Mods, skinheads, and football hooligans swaggering in the streets" to a top 10 singles powerhouse ("trying to improve themselves and do right by their fans") as "a five-year period in which The Specials were the conscience of the nation while Madness were its court jesters." The fall, too, is covered--apparently life has not been kind to many members of the band in the years since they ruled the charts--so the redemption afforded the band by the nostalgia of Madstock and the magnificent accomplishment of The Liberty of Norton Folgate makes up for their years in the wilderness. - DVD #3: "Madstock ‘09 – A Fan’s Tale"
It's over seven hours of Madness goodness for fans! As you know, the band has been releasing remastered and expanded versions of all of their original albums (including double 10" vinyl editions of One Step Beyond..., Absolutely, and 7, which can be picked up through Rockers Revolt), but I had missed the fact that their 1999, long out-of-print album Wonderful has been reissued with a bonus disc, too. This wasn't on my radar then, so I need to pick up a copy now! Dates for Madness' November/December "Do Not Adjust Your Nut Tour" of the UK can be found here. Having said that, UB40 did perform killer (and still very relevant) versions of "Tyler" (a song that decries the injustice and racism of the US judicial system), "King" (a tribute to MLK), "Little By Little" (which calls for the oppressed classes to rise up against the rich), and "I Think It's Going to Rain Today" (a Randy Newman cover that is basically about being down and out--and how crappy people are to each other) from Signing Off (their debut in 1980) and "One in Ten" (about how our society ignores the disenfranchised: "A statistical reminder/of a world that doesn't care") from Present Arms (see videos that I taped of several of these songs below). I never imagined that I was going to hear some of these tracks performed live, so this was a real treat for a long-time UB40 fan. There were other tantalizing hints as to what the show could have been, had the band been freed from their US market pop-reggae constraints--UB40 really cut loose with a thrilling version of "Dance Until the Morning Light" (which Maxi Priest sang with them on Twentyfourseven (2008), which has some really terrific--and political--songs on it, such as "Oh America" and "Middle of the Night") and the mega-charged dancehall tune "Reggae Music" with bassist Earl Falconer on vocals (from 1993's Promises and Lies), which is below. The set list for this evening included: "Stop That Train," "Here I Am (Come and Take Me)," "One in Ten," "Homely Girl," "Bring It On Home," "Cream Puff," "Cherry Oh Baby," "Tyler," "King," "I Think It's Going to Rain Today," "Little By Little," "Higher Ground," "Boom Shacka Lacka," "Dance Until the Morning Light," "Reggae Music," "Kingston Town," "Red Red Wine," "Baby," "Can't Help Falling in Love,""Please Don't Make Me Cry," "Easy Snappin'," and "The Way You Do The Things You Do." While ex-lead singer Ali Campbell (who split with the band in 2008) was missed, his brother Duncan did an extraordinary job--he's clearly yet another gifted performer in the family--and the uncanny resemblance of his singing voice to his brother Ali's certainly helps seal the deal. Note: this posting has been corrected. As Luci Lockit on the UB40 site fan forum was kind enough to point out, UB40's US tour was in support of the American release of Labor of Love IV (not the 30th Anniversary of Signing Off, as I had originally stated)--and that the UK tour that immediately follows is in celebration of the 30th anniversary of the release of Signing Off, where they will perform the album in its entirety (and a deluxe edition of that album is being issued in the UK, too). Apologies to everyone for my confusion! New Albums from The Moon Invaders and The Caroloregians--plus Babylove & the van Dangos, the Club Moonstomp 7", and Trojan Skinhead Reggae! 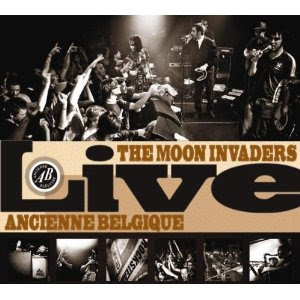 The word from Chuck Wren at Jump Up Records is that he has the new live CD from the awesome ska-soul Belgian act The Moon Invaders, Live at the AB Club (Grover)--and that The Moon Invaders' skinhead reggae alter ego, The Caroloregians, have a new CD/LP, Funkify Your Reggae, coming down the pipeline soon! I have a feeling that both of these albums are going to be vital additions to The Duff Guide to Ska collection. If you were fortunate enough to catch both of these bands on tour of the USA this past summer (read The Duff Guide to Ska review of this show--and watch video footage of both bands in action--here), you know these bands are incredibly good (their absolutely sensational split CD, Hot Blood, Cold Weather is essential!). 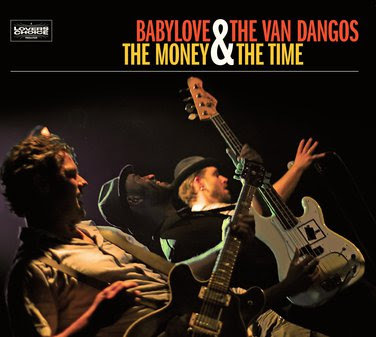 Speaking of Euro ska-soul acts, I just picked up and listened to the new Babylove & the van Dangos LP, The Money & The Time (Jump Up) on my cheap-but-good Vestax Handy Trax record player (I've actually used it in a Fat Albert/MacGyver DJ set-up and it worked really well). We'll review The Money & The Time soon, but can tell you now that it's stellar. Even though I was hundreds of miles away when Club Moonstomp happened, I feel like I was kind of there after playing the Jump Up commemorative colored vinyl single, featuring new and rare material from Roy Ellis (Symarip), Eastern Standard Time, Mr. T-Bone, and Green Room Rockers. Not sure how many of these Chuck has left after offering them at the gig, but they're worth tracking down. Lastly, I mail-ordered The Trojan Skinhead Reggae Collection from Ernie B's Reggae (a double-CD set for $8.99, so I figured how could I go wrong?). It turns out that is it an abridged version (40 out of 50 tracks) of the four-CD Trojan Skinhead Reggae Box Set--which I don't have--and has many cuts from 1968-1972 that were new to me, like Lloyd Charmers' "Dollars and Bonds" and Derrick Morgan's "Copy Cat." Good stuff. 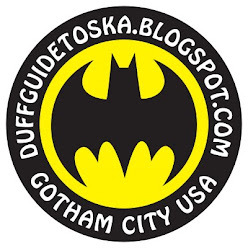 Duff Video Vault: The Scofflaws' "Four Seasons" and The Toasters' "Tunisia"
The Duff Guide to Ska is pleased to offer up the third installment of our video flashback of The Toasters and The Scofflaws in action at NYC's Palladium in November 1992 (these were taped as bumpers for a one-off television special that is now lost to the ages). Click here to see a short clip of Mike Drance and The Scofflaws performing Toots and the Maytals' "Four Seasons" (a fan favorite), while The Toasters play a sweet cover of Dizzy Gillespie's "Tunisia." The Toasters' "Original Man" and The Scofflaws' "Daniel Ortega"
The Toasters' "Thrill Me Up" and The Scofflaws' "A Shot in the Dark"
2011 London International Ska Festival Update: Newly Added Bands include Dub Pistols, The Trojans, Hotknives, Maroon Town, and Intensified! 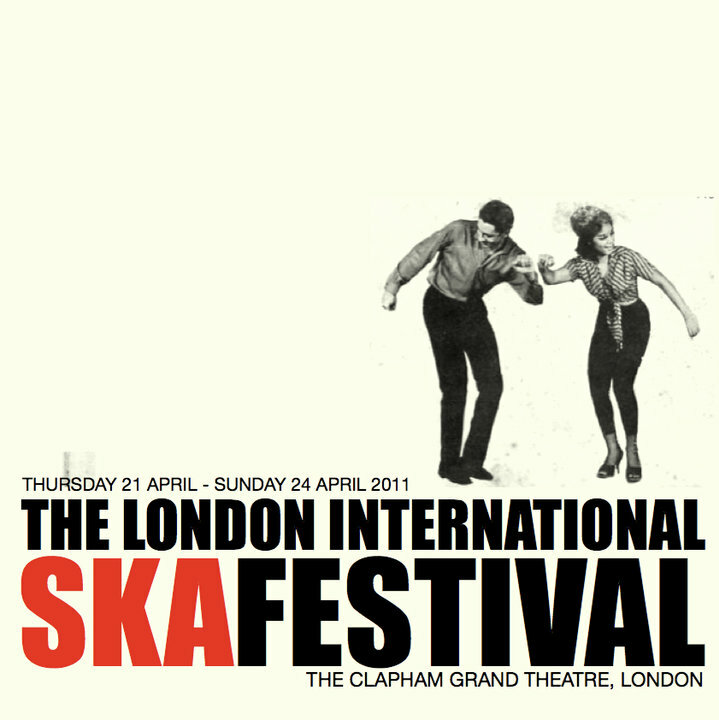 All I can say is that each new bit of news about the upcoming 2011 London International Ska Festival (April 21-24, 2011 @ the Clapham Grand Theatre) is even more mind-blowing than the last. In related news, both Maroon Town and Intensified have signed with Rockers Revolt Records and will be releasing new albums in early 2011! NYC Ska Gig Alert: Tip the Van, Hey Stranger, Mother Fletcher, The Hempsteadys, and Brave New Girl Tonite! Next Version City party: Saturday, November 6, 2010: Big D and the Kids Table (Boston), King Django Septet, The Drastics (Chicago), and Across the Aisle, also at Knitting Factory Brooklyn.